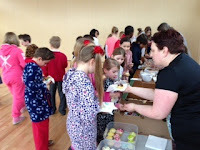 Some of our children (with the help of their lovely parents) baked night and day in preparation for their amazing Bake Sale to raise funds for last weeks Comic Relief day. Their efforts were worth while as they raised in excess of £160. Well done to all! !